The salmon farming giant SalMar is working with Norway’s University of Science and Technology (NTNU) to create a new professorship in the field of aquaculture. The project is being driven by the huge technological surge within the industry which both the company and the university believe will lead to major changes in how the sector operates in the future. As an example of this new technological revolution, Salmar points to its Ocean Farm 1, which is the world’s largest floating laboratory, and which it is now offering to the university to further its research work. Ocean Farm 1 is a full-scale pilot plant that allows for research on biological and technological aspects of fish farming at sea in a way that has not been possible so far. 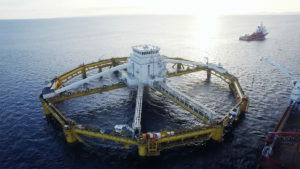 SalMar said it is equipped with the best in instrumentation and sensor systems for the aquaculture industry, providing unique opportunities to collect large amounts of data about the fish and the environment in the ocean. February 7, 2018 in News, Research, Technology.